Welcome to Relay. We’re glad to have you on board! Access Relay by navigating to relay.school. Log in with your school credentials and you are ready to go! 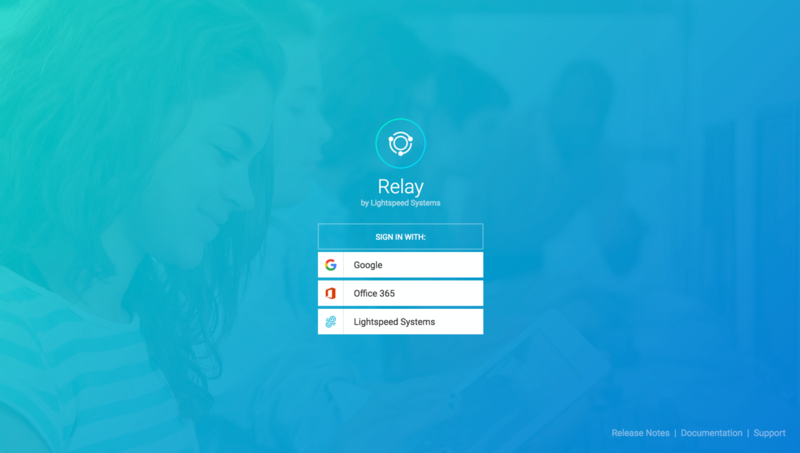 Relay is easy to set up, all it takes are three quick steps to get started! Note: We also suggest enabling recommended settings and configuring User Management data. 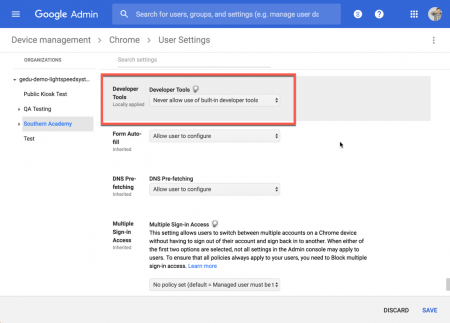 The first step to setting up Relay is confirming the default Internet access rules. 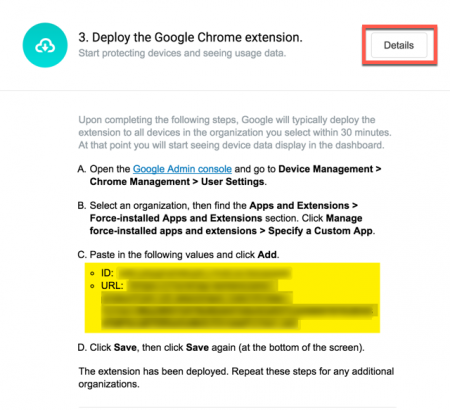 These rules prevent unwanted traffic from reaching your network and provide the first layer of protection. 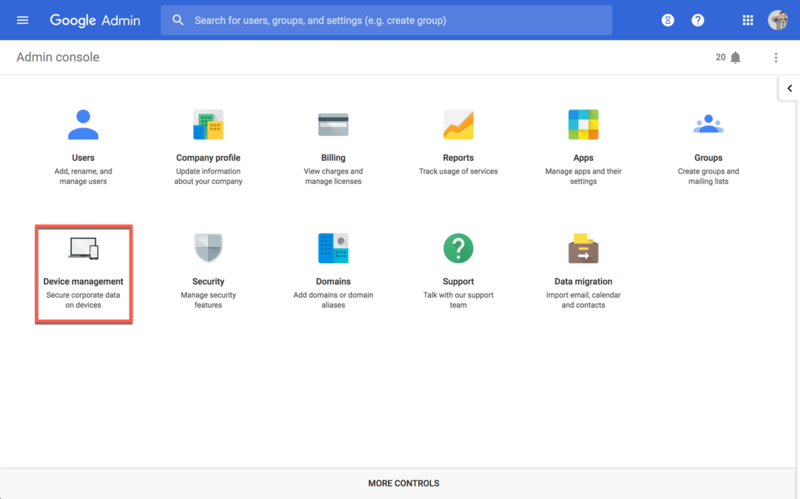 When setting up Relay, it’s a good idea to review the default Categories settings. Relay classifies websites into various categories. By default, most of these categories are blocked. At the Relay Getting Started page, click the Go link in the first step (Confirm the default internet Access rules) and review these categories. Within the Default Rules section, scroll through the list of Categories and determine which categories need to be blocked or unblocked. Click on the icons to the left of the category name to toggle a category on or off. – indicates the category is on and accessible. – indicates the category is off and blocked. Each category provides a brief description of the type of sites within it or you can search for a site’s category. Scroll to the top of the Rules page and enter the website URL in the Enter a website to check… search bar, then click Check. Example: In the following example we searched for www.facebook.com and the results show that Facebook is blocked and categorized as forums.social_networking. Click on the icon to the left of the category name to make the category (and Facebook) accessible. The second step to setting up Relay is to add terms to flag and enable email notifications. Flagged Terms and Email notifications are key to monitoring your network and ensuring student safety. 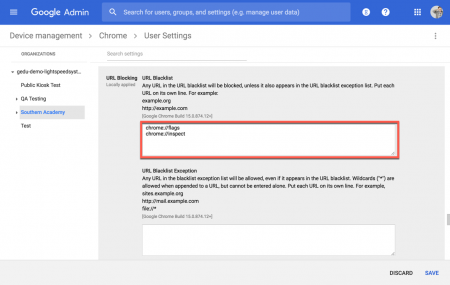 Email notifications will notify you when flagged terms appear on pages accessed by users. Any term can be assigned to be flagged, however, these terms are usually unsafe, pornographic, or violent (basically, anything that students should not be searching for). Flagged terms are assigned to one of three importance levels: low, moderate, and high. The higher the level, the more severe the term. Set up flagged terms and email notifications by clicking Go on Step 2 of the Relay Getting Started page. Before you set up email notifications, you need to create flagged terms. To add flagged terms individually, click the green plus sign above the list of flagged terms. 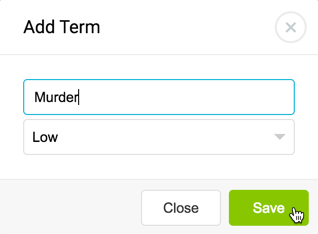 Enter your desired term, choose a level of severity and click Save to add the term. For example, we entered murder as the term and chose a Low severity from the drop-down menu. In this case, we want the term to be flagged since it is serious, but we also understand that a student could be searching for “murder” as part of a History or English class assignment. 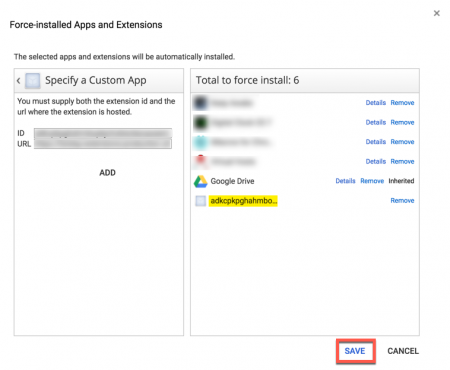 There’s also an option to upload a list of flagged terms developed by Lightspeed Systems. Download and save the badterms.csv file from here then click the import icon to the right of Terms. 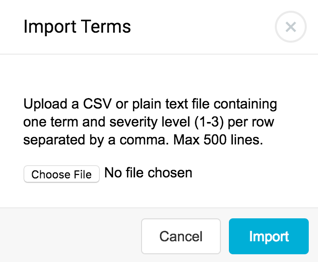 Click on Choose File, navigate to and select the badterms.csv file then click Import. Once the terms have been imported, you will see a long list with various danger levels under the Terms header. Click on the column title to sort the list by Term or Importance or use the search bar to quickly find any term on the list. To remove a term from the list, click the “X” to the right of the term. 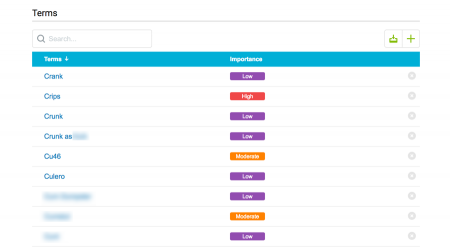 Once you’ve added flagged terms, create email notifications by importance and frequency. To create an email notification, click the green plus sign to the right of Email Notifications. Select the administrator that you want to send email notifications to by clicking the green plus sign to the right of their email address. In the Notification Preferences window, select the Danger Level for which you want flagged terms included in the notification. 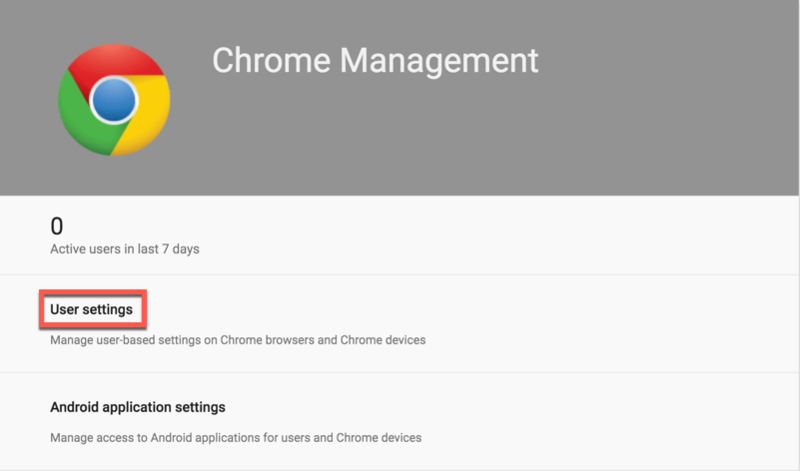 Then select the notification Frequency (Immediately, Daily or Weekly). Click Save to save the email notification. 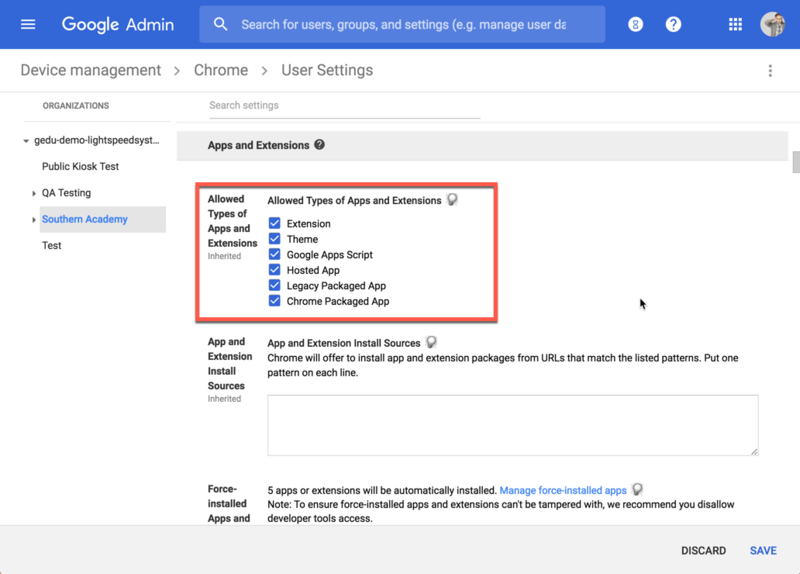 Determine the ideal notifications for your organization and repeat this process for additional administrators. 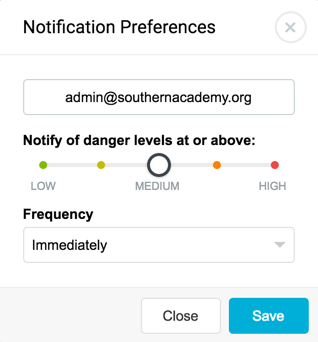 The Email Notifications list displays Name (admin’s email), Danger Level and Frequency. Edit a notification by clicking the mail address or click the grey “X” to delete a notification. 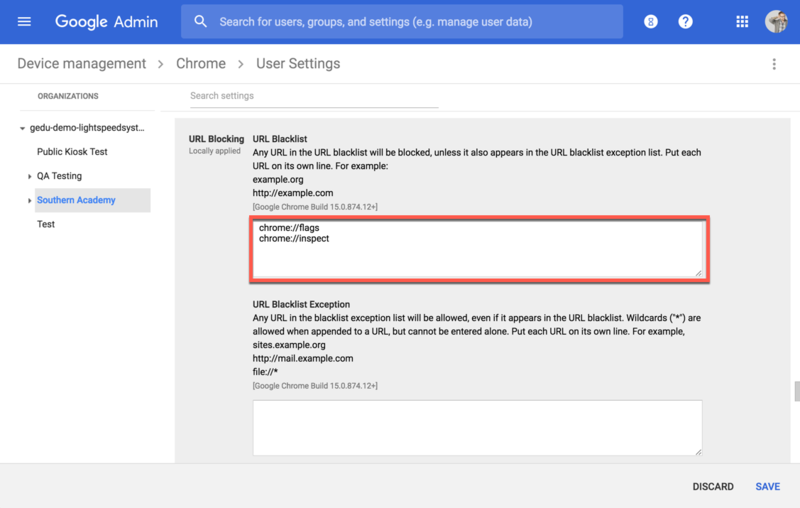 Deploying the Web Filter Extension for Google Chrome? 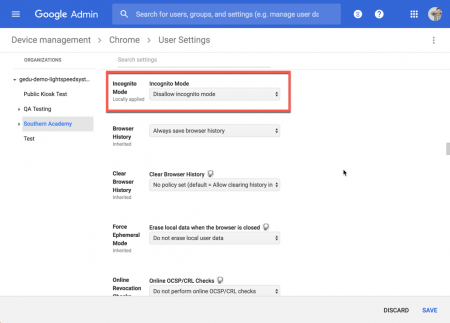 The third step of setting up Relay is deploying the Google Chrome extension to your users and setting up optional Google Admin console settings. 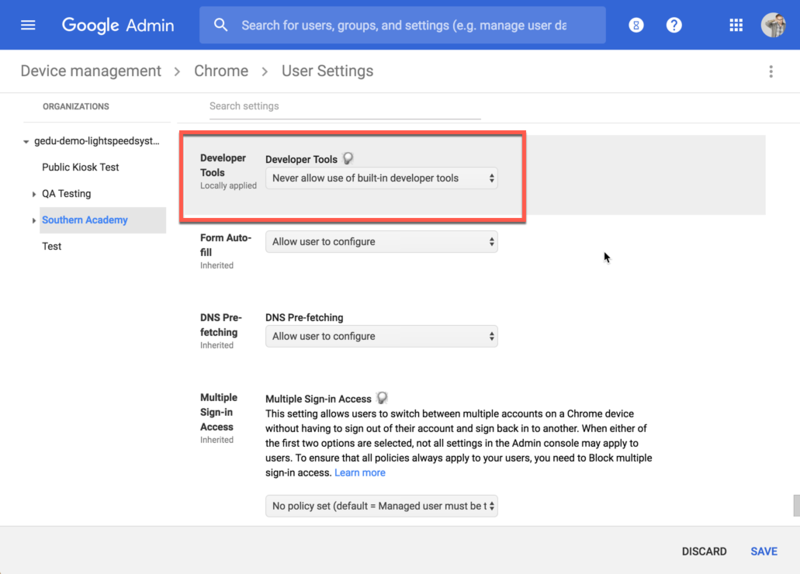 After you complete Relay’s three Getting Started steps, you need to import your organization’s users and groups into Relay. Navigate to the User & Group Management page by clicking Settings > User & Group Management from the main navigation menu. Click the Authorize button. 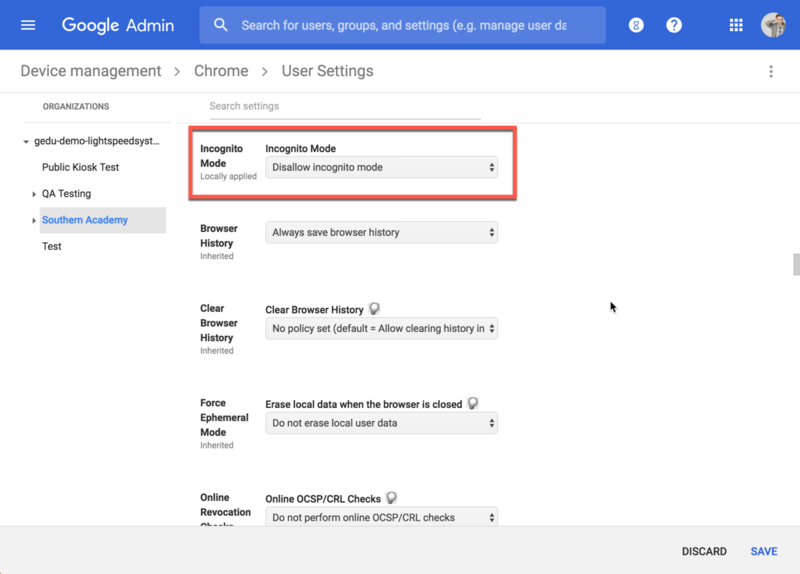 You will be redirected to a Google page that will prompt you for permission to allow Lightspeed Systems to view organizational units on your domain. 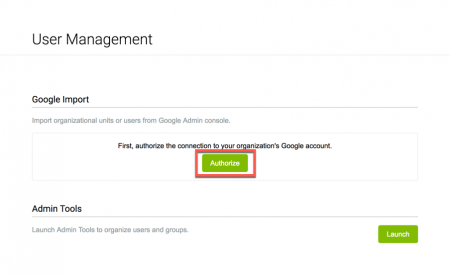 This opens a Google page that prompts you to allow Lightspeed Systems to view organizational units on your domain. Click Allow. Data – Import the Structure Only or Structure & Users. 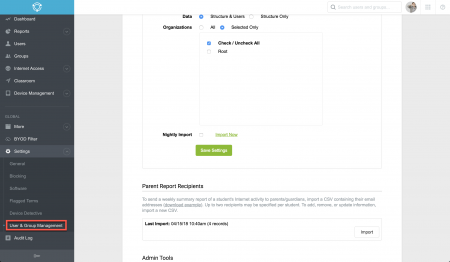 Organizations – Select the organizations you want imported into Relay. 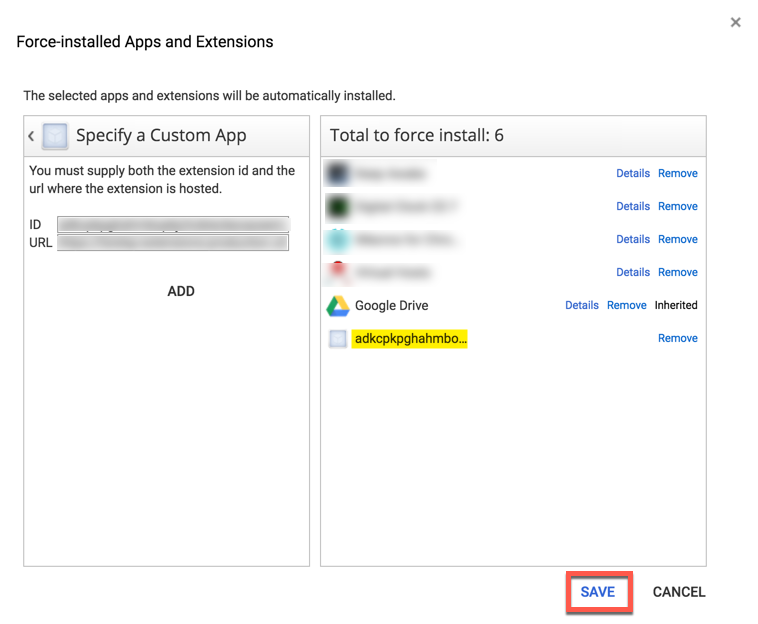 Nightly Import – Select this option if you want Relay to import your Data and Organizations nightly. 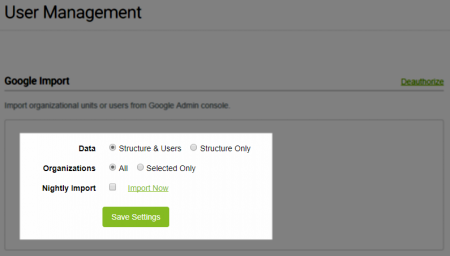 Import Now – Select this to import data immediately. NOTE: Make sure to click Save Settings prior to importing or the settings will reset. Click the Group Switcher Icon to view your organization’s schools and groups. The icon is part of the Relay top-level interface and is found on every page within the interface. Navigate through the list of schools and groups you imported to see the structure within each organization. 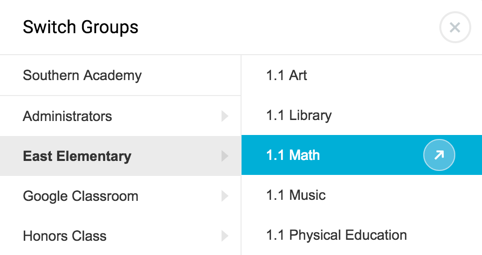 Click the arrow icon to select the school or group. 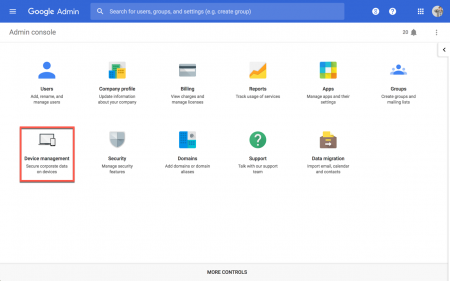 You can also organize your users and groups granularly through Launch > Admin Tools. 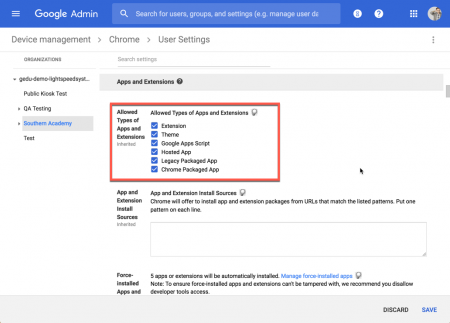 Learn more about importing users via Launch here.